Update 2: As to not continue to spread erroneous lies and half truths, we’ve pulled down the this whole article. God only knows who would find this post 6 months from now, skip the “update” and believe! Update: As many of you have figured out, this is indeed a joke. Gary Fisher stands by their G2 geometry and I appreciate them being good sports with this April Foolery. Although our own Guitar Ted didn’t think it was very funny! Gary Fisher Bikes Rolls Out "The 29erCrew"
The following is a press release announcing the new grassroots racing team dubbed “The 29erCrew” that is sponsored by Gary Fisher Bikes………..
Back in 2001 Gary Fisher had a crazy notion. He and a couple other non-traditionalists were messing with 29” wheeled mountain bikes. It was a fringe concept at the time. Fast forward seven years and 29ers are the hottest thing going in the mountain bike world. With Fisher’s legacy in 29ers and race team sponsorship, it made perfect sense for Gary Fisher Bikes to sponsor a team exclusively of 29er riders to prove the dominance of the bigger wheel. Northeast of Vermont, the Southwestern deserts of California, the shores of the United Kingdom, and everywhere in between. They’re men and women racing cross-country, endurance, and XTerra. 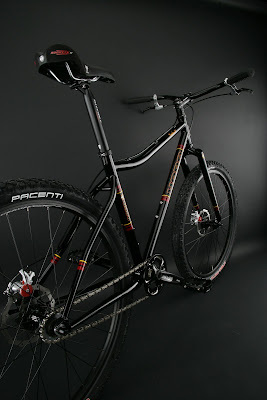 They ride rigid singlespeeds and full-suspension 29ers. About the only common denominator between teammates is the size of the wheels they roll on. course, the man, Gary Fisher. The 29er Crew website and blog. http://www.29ercrew.com will host the great stories of all the riders. There each rider will be posting blog entries, race recaps, and news from their lives. It’s an opportunity to showcase the different voices and perspectives of this diverse team. It’s fitting for a group of 29er riders. The groundswell popularity of 29ers was due to the passionate base of its believers. On the 29er Crew blog, the riders will continue to help foster the individuality and passion of 29er culture. (www.champ-sys.com) is providing the great looking performance apparel in lickety-split fashion. 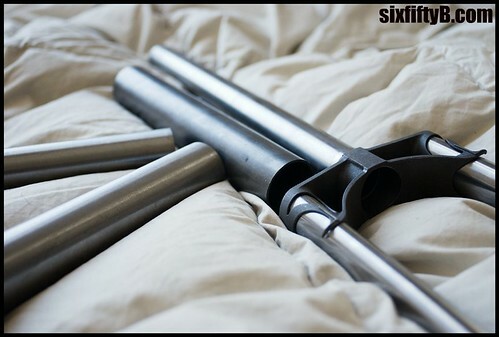 The folks behind the scenes here at sixfiftyB have been working hard at this 650b site. Recently it became 650b.com and we launched a database for your 650b mountain bike needs. Several folks have contacted us wanting more. Do you think there is a need to open our focus? 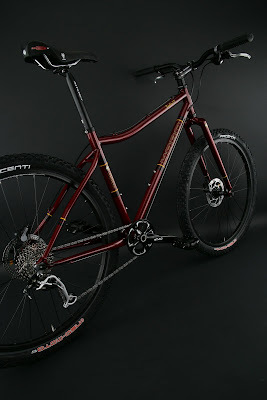 Not just the new 650b mountain craze that I enjoy so strongly but also the tried and true skinny tire version. 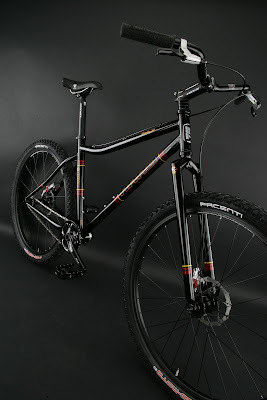 Including but not limited to 650b road bikes, touring and everything that holds the title 650b. A month ago I confirmed that Kenda is getting in the market of 650b tires. After the recent Taipei show the news went blogger or rather every blog and forum about 650b has posted the news. The news is old but the comments coming from Kenda are not. “We’ve also been asked by many product managers with various companies to offer our most popular tire in this new size format,” added Matt McClendon, Kenda’s OEM sales manager. We just had this bike in the stand at the shop I work at and I thought it might be fun for everyone to see one of these new versions of Origin 8’s carbon 29″er forks actually mounted up. It looks almost as though it is an OEM job with such a close match to the Inbred’s paint. Just a coincidence though. I have been informed by J&B Importers that the version of the fork shown here is currently available and is being distributed amongst their various warehouses. There still is a “black” version available, but that one is currently out of stock with availability set for May at the time of this writing. No word on if the “black” version will be available in the 420mm axle to crown measurement, but you would think that it wouldn’t be a problem to do that. Editors Note: This is an update on a couple of products being used and tested on a long term basis. The Bontrager Tubeless Ready Race X Lite wheels and Dry X tires made it onto my Fisher Hi Fi Deluxe test rig recently due to the fact that I needed tubeless tires and wheels to help me to avoid the dreaded flat tire caused by cactus needles which are prevalent along the trails of El Paso Texas where I spent spring vacation. I was a bit hesitant to use the rather light and nimble wheels in the unforgiving rocky environs of Franklin Mountain State Park, but I was rather pleased with the out come. You may remember how I was a bit concerned about wheel flex for a big guy like me on the Bontrager wheel set, and to be honest, I wasn’t expecting very good things out of the wheel set on these trails. The Bontrager wheels did just fine though and actually were a great asset on the many loose, steep pitches on the trails I rode. I didn’t notice the wheels flexing in the bedrock exposed off camber bits and tight turns were done with no drama. The acceleration factor was better than most wheels. That was something very noticeable. The tires were actually not the original set I tested last year that did not have the production versions “AR” beefier casing. These were new production versions and they did just great on the dusty, loose rocks and deeper gravely bits. I was impressed with the traction, speed, and cush of the casings. The tires were being run tubeless with sealant, so no flats to report either. Yeah! All in all, the Tubeless Ready System from Bontrager is very impressive and I highly recommend it. The only nit would have to be that the plastic rim strips for the Rhythm wheels are not yet available, but when they are, a wide range of possibilities will open up. Expect Bontrager to continue to add to the Tubeless ready tire pile as well. I’m hearing through the grapevine that the Geax tubeless ready offering that has been rumored to be coming soon is the well liked Saguaro 29″er. The Geax Saguaro will feature Geax’s “TnT” system, which stands for “Tubes, no Tubes” and will be okay to run tubeless with sealant. No word on just when the tire will hit the market, but I’m hearing it will be soon. Twenty Nine Inches tested some Geax Saguaro 29″er tires last year and we really liked the performance with tubes. Hopefully these new versions will uphold our confidence in these tires and perhaps make them even better since they will be tubeless ready. We will be looking for more news on this and update you when we hear more news. Stay Tuned! 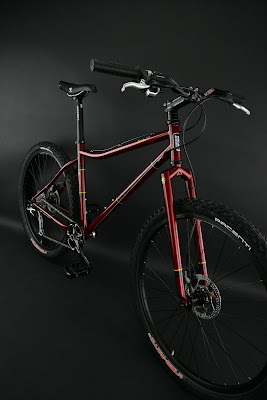 Jill posted new photos of the Haro 650b hardtails over at her blog. A handful of photos showing off very clean looking bikes. Almost too clean – get those things on the trail! My only beef with these photos are minor. Platform pedals, no zip tie mounts on the fork and plastic stickers on the rotors. Below is the mock up CAD of me on my Fast Boy which Ezra renamed the Fast Girl. The bike won’t be that color and it won’t have suspension but it is pretty cool to look at for measurements. Ezra has almost all my tubes in. A special top tube is on order and hopefully in this week. 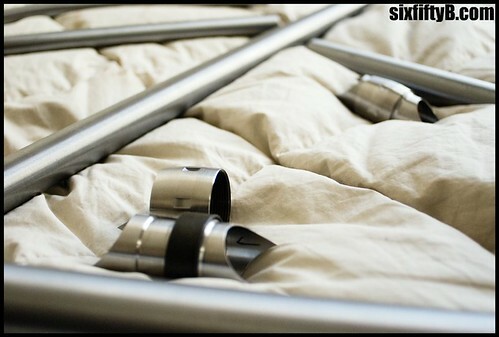 Below are a few teasers he sent me of the tubes laid out on his signature comforter. The fork and S&S couplers are my favorite so far. 29"ers: A Little More Mainstream? I just arrived home from my week long vacation to the typical pile of mail that any one of us accrues over such a period away from home. I recieved a few of “those” mail order catalogs in the pile. You know, the ones you get all summer long with the same mechandise on every page in every issue? Yeah………those mail order catalogs! Well, on page two of one of them there is a small grouping of 29″er related stuff featured. Hmm……this makes me wonder. 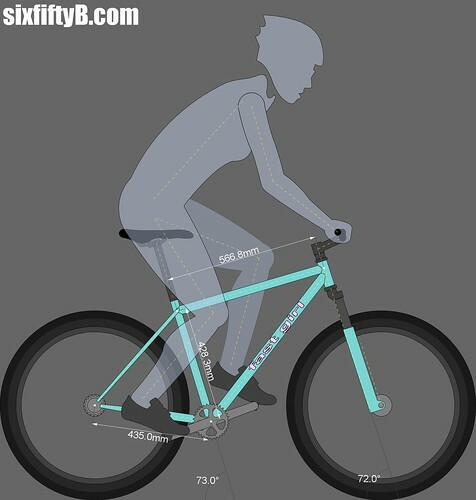 If these guys have caught on to 29″ers, what does it mean? Are 29″ers the latest trend to be cashed in on, or is it just another sign that sooner or later, 29″ers will be “just mountain bikes”? Assimilated into the mountain bike culture as a whole. Here’s what I’m saying: “They” probably don’t get it. 29″ers, that is. It is just something that popped up on the radar and they thought they would take a stab at it, is my thinking. I’m not sure that a whole lot of independant bike shops are “getting it” yet. At least I know there are more than a few around here that don’t. Then you would also wonder about the demographic this stuff is aimed at. I’m guessing there are more than a few scratching their heads now after looking at the page and wondering, “What is this 29″er stuff anyway?” They maybe are seeing the term now for the first time. Well, if anything, it maybe is getting 29″ers talked about a little more. A few more people will ask about it, do computer search engine stuff on the term, and maybe some will even get into 29″ers because of it. 29″ers becoming a little more mainstream? Hey, bring it on, I say! You are currently browsing the The Big Wheeled Ballyhoo blog archives for March, 2008.